Alice is right. It is a delicious wine, from an exceptional producer. It is white, it is made of Viura and the name is Viña R. Lopéz de Heredia. Alice is of course Alice Feiring, who nurtures tradition and wine making without unnecessary human interference. In the book “The battle for Wine and Love; or how I saved the world from Parkerization” she describes, in a wonderfully vivid and personal style, the meeting with the charismatic Maria José López de Heredia. Their lunch in Haro was accompanied by a Viña Gravonia. We are told that the wine, of vintage 1997, is “the star of the show”. I tasted the 2002 vintage and was overwhelmed by the character and intensity of the wine. In fact, it was some time since I enjoyed a classic white Rioja. The experience made me realise how much I have missed this style. Of course it is nice to have easy-to-drink, fresh, fruity white wines. But variation is needed and then I prefer an eloquent personality. R. López de Heredia has a long history. Founded in 1877 as the first bodega in Haro and one of the first three in Rioja. This was at the time when French merchants came to Rioja to find alternatives to the French wines after the attacks of phylloxera in their home country. The young Don Rafael López de Heredia y Landeta, who then studied winemaking, followed in their footsteps and fell in love with Rioja. Soon the bodega was established. It is still owned and run by the family who cherishes the old traditions. 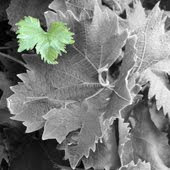 The grapes to Viña Gravonia come from the vineyard Viña Zaconia, located just next to the bodega. A stony and poor 45 ha large piece of land with 45 year old Viura vines. 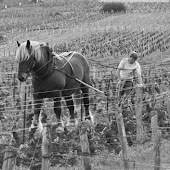 The vine is made in the old-fashioned traditional way. After the crushing of the grapes, with immediate removal of the skins, the must is fermented on large, 60 hl wooden vats. Only the grapes’ indigenous yeast is used. The wine is matured at least four years on 225 litres barriques of America oak, with racking twice a year. It is fined with egg whites, bottled unfiltered and receive an additional four years of maturation on bottle before it is released to consumers. The alcohol is pleasantly low 12,5%. A detail I appreciate. 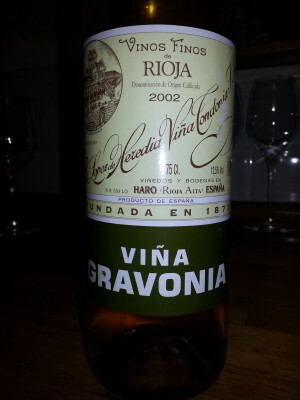 Viña Gravonia 2002 has a beautiful hue of deep dark gold. The nose is voluminous and permeated of slightly sweet wood. Full-bodied with good acidity, rich almost tannic. Concentrated developed palate with loads of oak and nuts. Delicious finish with very good length.